In December 2014, I received an email from author Jennifer Steuck and illustrator Slava Tayon regarding their intention to create a book that would help make the theory of multiple intelligences accessible to elementary school students and parents. In this week’s blog, Jennifer and Slava reflect on the creation of their self-published, multiple intelligences-inspired children’s book, Meet the Me’s. Our mission in writing Meet the Me’s was to start a conversation about multiple intelligences and what it means to be smart. Intelligence has many different facets, and we want to help others appreciate diverse learners. Before writing the book, I understood the concept of MI intellectually, but I developed a much deeper sense of the theory by engaging with it directly in this text. Our writing process began with thinking about the available research on the brain and the neural pathways of intelligence. Howard Gardner’s work on MI became the foundation of this book. Our cover design is intended to draw the reader in and pique curiosity about the content within its covers. It is a pictorial metaphor of thinking, feeling, and perceiving. The light at the bottom is turned on, the circuitry activated, and a new idea is planted in the mind. The design also includes the eye that is featured on the cover of many of Howard Gardner’s books. Our version of the eye is portrayed in front of a color wheel, which represents the kaleidoscopic variation in human intelligence. 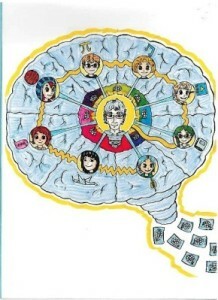 The book is written in epistolary format, in which Professor I.Dea (Howard Gardner) corresponds with the eight “Me” characters, each of whom symbolizes a component intelligence of MI. Slava’s graphic representations allow the ideas to come alive by turning the various components of MI into characters that make the concepts more personal and meaningful. Each of the “Me” characters is assigned a unique icon, which serves as a visual representation of their respective pathway. In response, PictureMe reveals that he processes and expresses himself through images. Throughout the various Me’s pathways, we’ve included inspirational quotes, vocabulary words, and clarifying questions and answers. At the end of the book, readers will find a glossary, as well as an extensive bibliography of picture books that explain the life and accomplishments of people on their corresponding pathways. We’ve also addressed the possibility of a ninth intelligence, Meaning Intelligence, on the last page of the book. Although the MeaningMe does not meet all the criteria for an intelligence as defined by Professor Gardner, we felt it was important to include. Our hope is that other readers of Meet the Me’s will discover more about themselves, one another, and the process of learning itself. We encourage people to discuss what makes them curious, how they learn, and how they express themselves. Meet the Me’s is available for purchase in-store and online via The Bookies Bookstore in Denver, CO. Older PostMI Expert Dr. Thomas R. Hoerr's Interview with Brazilian Magazine, "Nós"